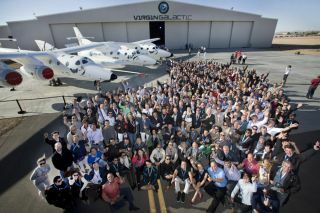 Virgin Galactic's future private astronauts gather with Sir Richard Branson (center) for a group photo at Virgin Galactic FAITH hangar in Mojave, Calif., on Sept. 25, 2013. At left is the WhiteKnightTwo carrier craft mated with SpaceShipTwo. MOJAVE, Calif. — John Graves, 59, doesn't consider himself a daredevil. "I'm a techie," the soft-spoken grandfather of five tells SPACE.com, his gray hair luminescing under black lights dressing up a Virgin Galactic hangar in Mojave, Calif. The day, Sept. 25, turns out to be too windy for SpaceShipTwo to fly so the annual gathering of Galactic's customers shifts to behind-the-scenes tours, briefings about flight operations, and of course, face-time with Virgin's rock-star founder, Richard Branson. The story of how Graves, the owner of a small software company in Rockville, Md., ended up at a Virgin Galactic party that Wednesday morning is not all that unusual: In 1969, when Graves was 15, Neil Armstrong climbed out of his spaceship and put his boots on the moon, firing up the boy's imagination. Life went on. The awe stuck. "I wanted to go in space, but that's not where my career led me. You have a family, kids," Graves said. More than 40 years later, Graves read Idea Man, a memoir by Microsoft co-founder and billionaire Paul Allen, which discussed Allen's funding of SpaceShipOne, a prize-winning prototype that made three suborbital spaceflights in 2004. "Something clicked. It was like a re-engaging of something that I had as a kid," Graves said. "I looked up Virgin Galactic and within five days — after my wife's approval, she wouldn't do it, but she supported me — I signed up. It was a very quick decision." Graves — customer number 369 — will have some time before he flies. SpaceShipTwo manufacturer Scaled Composites currently is testing the vehicle in advance of the start of commercial flights, now expected no earlier than mid-2014. "I don't exactly how long down the road it's going to be, but it's fun to be part of this early group of people who get this opportunity," Graves said. Sir Richard Branson speaks to a group of future astronauts at the FAITH Hangar of Virgin Galactic in Mojave, CA September 25, 2013 in Mojave, CA. Asked what he wants from the experience, why it's worth $200,00 (the price has since risen to $250,000), Graves is torn between two ideas: having a rocket engine launch him into space, or being high enough above Earth to look down and see it as a planet. "When the day comes, when it happens, I guess I'll see which has the longer-lasting effect on me," Graves said. "It's not going to the moon, but it is going to space." Already, even the prospect of flying is having an impact. "This has awakened an adventurousness that I have. I'm a business adventurer, but I never would have considered myself an extreme adventurer. It's weird, but I would be more afraid of sky-diving than I am of going up in this spaceship," Graves said. Graves stands up to join the 400 or so other Virgin customers heading outside the hangar for a group photograph in front of SpaceShipTwo, then doubles back to add one more thought. "After meeting Richard Branson, I have taken up kite-surfing — at my age," Graves said. "He has inspired me." A few minutes later, a newcomer joins the table. He is Viktor Krasovec, a 25-year-old entrepreneur from San Diego who is here with his aunt, one of Virgin Galactic's first customers. "When she first signed up, I thought she was crazy, but that it was the coolest thing I had ever heard. It's always been her dream," Krasovec said. "Now she's convincing me to go."